The DSPOT Series offers a full line of Digital Signal Processors. 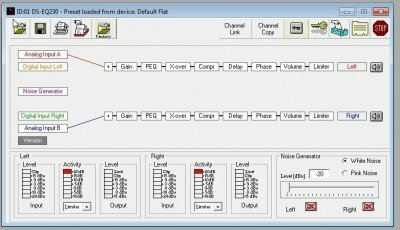 These processors allow the user to manage and clarify the sound produced in their speaker system. Each model can be accessed by the front panel or the convenient, easy to use, included software. The Galaxy Audio DS-EQ230 is a 30 x 2 digital graphic or parametric equalizer (PEQ), crossover, compressor, delay, polarity inverter, limiter, & muting, in addition to input and output metering. 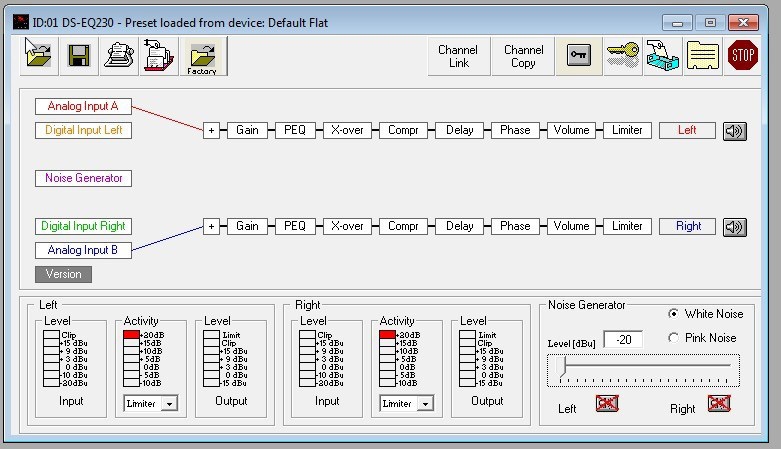 EQ channels have a High and Low Pass Filter with many slope controls. Adjustments can be done by typing your settings, or making adjustments to the graph with the mouse. The DS-EQ230 comes with 8 preset EQ settings to choose from, or build your own and save up to 64 presets to a drive or the device. The DS-EQ230 offers a diverse list of included added features, as listed above, like the compressor, delay, and limiter. Additionally, the DS-EQ230 has both a White and Pink Noise Generator, useful for setting up your system, or for use in sound masking systems. Navigation through the software and saving presets both on and off location are extremely easy. The DS-EQ230 is the perfect solution for any installation. 20 Recall Memories, 4 Factory and 16 User.